NatureTrack adds two more exciting films to its official selections! March 22-24, 2019 is going to be a great weekend in Los Olivos! Visit the NatureTrack Film Festival website to check out the list of official selections. In addition to those posted January 1st, we've added two new films, Stumped and Persian Powder. Both films offer insight and positive counter points to what many would consider challenges. 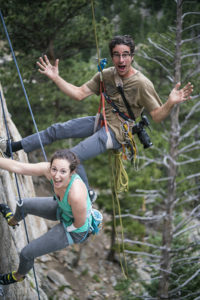 Stumped was directed by Cedar Wright and Taylor Keating, two Boulder adventure filmmakers. Cedar is a longtime professional climber for The North Face and has married his love for adventure with his love for storytelling. Taylor is also a climber, but makes a grand total of $0 for doing so. Their film Stumped follows Maureen Beck, a professional adaptive climber born missing her lower left arm, who hasn't let anything stop her from achieving her goals. Fueled by humor, grit, Oreos, and beer, Maureen embraces her unique abilities to puzzle out routes to the top. In an article written by Faith Bar for Shape Magazine, Maureen says, "It's different, but I don't think it's as hard as some people may think...It's all about solving a puzzle with your body—so essentially someone who is five-foot is going to approach a climb differently than someone who's six-foot because everybody's body is different. We are all as limited and unlimited in climbing as we make ourselves." Persian Powder was directed by Erik Bulckens. 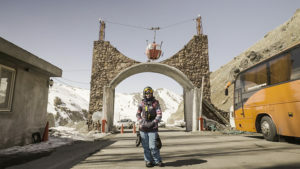 An avid snowboarder, Erik brings his focus to a mini-documentary about Iranian pro snowboarder Mona Seraji who invites two Australian friends to go snowboarding with her in the mountains above Tehran. While the 3 friends enjoy carving down the mountainside, the film also provides a glimpse of a country and culture we hear very little about. Keep abreast of all the latest news about the NatureTrack Film Festival by following us on facebook, twitter, and instagram! On March 22-24, 2019 we invite everyone to enjoy a Film Festival which supports the next generation of empowered nature lovers! ← Listen to Win a Pass to the NatureTrack Film Festival!